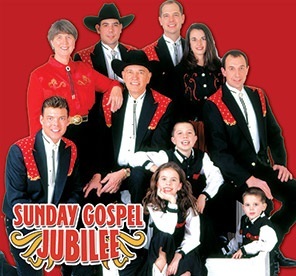 Sunday Gospel Jubilee is one of the must-see shows in Branson where talented Bacon family will lift your spirits with an old fashioned Branson Gospel Show featuring southern Gospel quartet with rousing vocals and hilarious comedy. The Grand Country Music Hall will be filled with gospel medleys, favorite old hymns, and inspirational songs, both old and new. Every Sunday at 2 p.m. from February through December, it’ll be exciting to watch Max Bacon and his talented family perform gospel hits, plus Branson legend Randy Plummer. With the perfect harmonies and hand-clapping excitement of southern gospel music, you’ll find yourself singing along with the cast as they lift your spirits with gospel songs. You’ve probably heard of food for the soul, but this time in Branson you’ll be watching a weekend show for the soul. That’s exactly what the Sunday Gospel Jubilee gives to audiences every Sunday afternoon. The talented Bacon family will fill your hearts with joy as they perform one pure southern gospel hit after another. If you enjoy sweet Southern Gospel songs, this is the show for you to lift your spirits through song. Whether you just want a show to uplift your spirits or you only want a clean, wholesome entertainment, this is the show to watch. Sunday Gospel Jubilee combines gospel music with good clean laughter and family fun. As the curtain opens, you’ll find yourself hand-clapping with fun and excitement as the cast start to perform good old Southern Gospel music. See these talented performers of the show take the stage to perform all your toe-tapping gospel favorites, from I’ll Fly Away to Turn Your Radio On, it’s sure to be a good time for all. Randy Plummer will join the talented family in bringing inspirational music to life. On its 26th year, Sunday Gospel Jubilee brings wonderful music with family fun and hilarious comedy. Don’t miss the chance to experience the uplifting harmonies of gospel songs in the show where the talented cast will have you singing along with your favorite Southern Gospel classics. Sunday Gospel Jubilee makes every Sunday afternoon the best time of your weekend. This rousing good gospel gathering of family and fun is also filled with country music, both the classics and today’s hot country hits. In addition to all the amazing music performed in the show, you’ll be treated to a wholesome comedy. After more than two decades of Ozarks tradition, Sunday Gospel Jubilee is still going strong, and continues to bring in more people every day. Max Bacon and the rest of his talented family along with the cast put on the show that will truly get you in the mood for a beautiful Sunday afternoon. To make the Sunday afternoon show in Branson even sweeter, legendary Branson performer and recording artist, Randy Plummer, delivers a uniquely happy voice to the mix. If you are looking for a genuine Southern gospel, classic country favorites, and current country hits, there’s just one perfect show to watch in Branson, Sunday Gospel Jubilee.